The Good Lie is a perfectly good movie. It has simple aspirations and intentions and within these goals it does what it sets out to do with perfectly reasonable results. There isn't an over-complication of themes or a conflict of interest in the characters and filmmakers objectives, but more this is a film that feels as if it has one mission and that is to tell a story of great risk and sacrifice leaving how it makes you feel up to you. This is strangely unique to a story that looks and feels like the one The Good Lie is telling though because typically we are manipulated into feeling a certain way for the victims of such circumstances and led to a foregone conclusion from the opening scene. There is certainly an expectation that one would come away from the film feeling largely sympathetic for the lost children of Sudan, but the film also understands that this is largely a case of bad luck-being born into an unfortunate time in an unfortunate corner of the world. The film doesn't make a case that we, as individuals or as a country, should be doing more to help the situations of those less fortunate than us in poorer nations, but if anything reminds us to be thankful for the opportunities offered to us by the place and time in history we were born. As much as I appreciate the film traveling the lesser of two roads and approaching its inherently uplifting story with a straightforward mentality that doesn't necessarily make the proceedings all that compelling. Like I said, this is inherently uplifting and there is no escaping that fact and so as the film glides from one setting to the next we are left knowing that everything will turn out more promising than it began, yet it is told in such a conventional, almost safe fashion in terms of filmmaking techniques, dialogue, even overcoming certain obstacles that we never feel the tension or emotion that should come to light in some of the situations that arise. This is all to say that The Good Lie could (almost easily) have been a better, more affecting film than the product we have here, but in terms of what it was meant to do and what it ultimately does it sits squarely in the middle between excellent and horrible. Paul (Emmanuel Jal), Jeremiah (Ger Duany) and Mamere (Arnold Oceng) arrive in Kansas City. 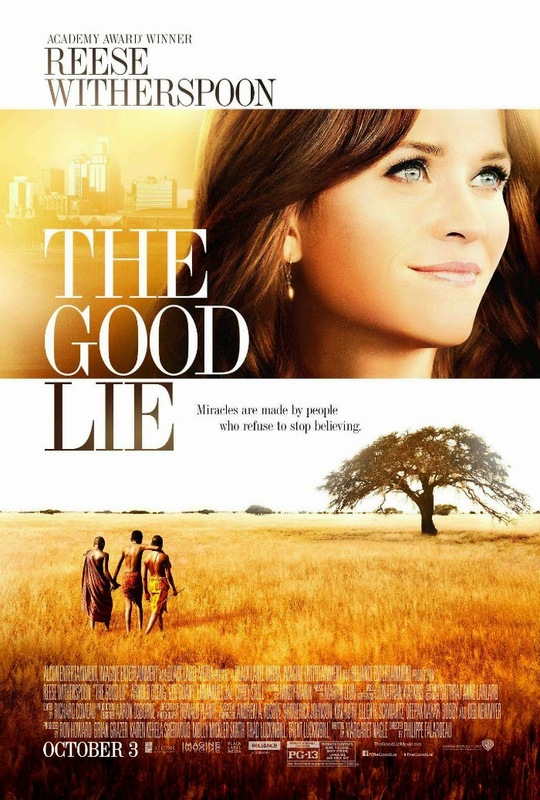 Initially surprising is the amount of time The Good Lie spends in Sudan given how much the marketing campaign has championed Reese Witherspoon as the hero swooping in to save the poor orphans lives. Known simply as “The Lost Boys” and orphaned by the brutal Civil war that began in 1983, we see countless young victims travel over seven hundred miles on foot in search of safety. Here, the focus lands on a trio of siblings including the eldest Theo (Okwar Jale), his younger brother Mamere (Peterdeng Mongok) and their sister Abital (Keji Jale). After their parents are killed in an attack by the Northern militia Theo assumes the role of chief (the position their father held in their village) who will lead the surviving members of their group to a refugee camp in Kenya. This is of course much easier said than done as Theo and his band of young survivors encounter hardships and terror in the form of treacherous terrain and hostile soldiers sniffing them out. Along the way they come in contact with other children on the run and form a bond with Jeremiah (Thon Kueth) and Paul (Deng Ajuet) who help strengthen their faith and teach them survival skills key to allowing them to make it safely to Kenya. Once at the refugee camp the close-knit group grow together while finding their own paths in what they hope to do in life. It is nearly fifteen years after they arrive that the now adult Mamere (Arnold Oceng), Abital (Kuoth Wiel), Jeremiah (Ger Duany) and Paul (Emmanuel Jal) are given the opportunity to come to America and begin a new, seemingly more promising life. Once the characters reach their Kansas City destination and Witherspoon's Carrie Davis comes into play though director Philippe Falardeau (Monsieur Lazhar) transfers from something beautiful, something unexplored into that of a cheap comedy with easy laughs garnered from cultural differences. Again, despite the marketing campaign heavily relying on the story of the boys reuniting with Abital after legalities separate them this is more of a fish out of water tale about how these once "Lost Boys" acclimate with their new world and are forced find themselves. There is a moment in the film where Jal's Paul begins to wonder what the point of having more opportunity is worth if you are still unable to lead a fulfilling life. Witherspoon's character is brought in as an employment agency counselor who helps the boys find jobs, but does so at local grocery stores and in assembly line positions. They are housed in a small apartment and work to pay back their airfare rather than beginning to build their own lives. Things admittedly look almost as grim in their new predicament as it did in Kenya minus the comforting fact of actually being at home. Gone are the charms of familiarity and present are these selfish Americans who throw away expired food and don't even stop to consider a more helpful alternative. Paul is not only discouraged that their group has been divided over a technicality, but he isn't any happier in what is supposed to be the land of opportunity. Mamere has dreamt of becoming a doctor and so his intention was to go to school upon arriving while Jeremiah has always been a man of faith and finds solace in volunteering at a local church and teaching Sunday school. Paul is the black sheep, lost in a world unknown, experiencing dilemmas where he has a hand in the outcome (something else he isn't accustomed to) and not only dealing with that kind of power and responsibility, but coming to terms with the fact of how hard it is to find the balance of everything we'd like to have and be able to do in our lives. It is an interesting character study, something to be highlighted in terms of cultural differences besides those aforementioned obvious comical aspects. The next surprising aspect of The Good Lie was the fact the film actually decides to spend a fair amount of time on this internal struggle. Rather than allowing Carrie's personal issues to correlate with the struggles of these refugees and making the film about what she can learn from them and how she can improve her own lifestyle because of the insight their example brings-the focus remains on who it should. Mamere, Jeremiah and Paul are the clear stars, but it is the lesser effect with which Falardeau chooses to convey their plight that the film fails to live up to the expectations the first half of the film sets. Carrie (Reese Witherspoon) forms a close bond with Jeremiah and his brothers. In an effort to get around these self-righteous conventions that typically plague the feel-good movies this film would certainly fall into we are happy to see the focus remain where it should and Witherspoon, who has to be the face on the poster because there's really no way around it, give what she can in a role that is supportive both in how its written and how she functions. The movie would like you to believe that she is our surrogate into the complicated world of navigating these people into the modern day and age while, for the first time, becoming emotionally involved in their fight to retrieve their sister, but more than anything she is simply a supporting player who is necessary for this story to make sense and move forward. Witherspoon does what she can in the role and gets a few one-liners that fans of hers will enjoy as she isn't exactly playing the classiest of ladies here, but this is by no means the Blind Side-type role the promotional campaign has built it up to be. The same can be said for Corey Stoll and Sarah Baker who show up as more stateside support for the refugees in their quest to both find jobs as well as to assist in recovering the latest in the trend of loss they have all experienced. The most interesting aspect of the film though is that the three lead roles are filled by actual Sudan refugees who made their way to America and are now starring alongside Witherspoon in a major Hollywood production. Though the film can sometimes suffer from the gleaming cinematography and uninspired dialogue of a Hallmark original movie as well as the over-reliance on spiritual guidance as an option to make things happen as a Christian-based film will do the lack of acting chops by these three leads is forgiven due to the clear authenticity they bring. Oceng is specifically strong as the leader of the adult group who is looked to for both guidance and support while Duany is solid as the rock on which his brothers lean and Jal pulls the heaviest weight with an unexpected confidence in what has to be his first actual performance in front of a camera. It is in these three that we find the well-intentioned nature of the characters that makes these "Lost Boys" and their unlikely companions as endearing as they should be despite the nature of the film feeling, oddly enough, uninspired.